Over the years I've often written on the topic of sign language. My ASL (American Sign Language) background dates waaaaay back to when my older daughter was in grade school. She's a very oral hard of hearing adult at the severely hard of hearing range. Because she's too deaf for the hearing, she finds it's easier to say she's deaf. She and her sister grew up using it thanks to my taking what classes I could + her eventually going to a school with what is called Total Communication. That same older daughter loves to collect the many ways sign changes internationally, so I've also become somewhat aware of how signing differs in other countries. Because the language is so totally different from other languages, I really can't say how long it will take you to feel comfortable in it. Also, like any secondary language, if you don't use it, you will start to lose it. Since this will never be your primary language, it would be a good idea to make it a practice to run any story or song you sign past either an interpreter or somebody who uses it as their primary language. Even then, like any language, there may be more than one way to say/sign it. Why use sign language with your storytelling? It's a great way to involve an audience. It's now the 3d most used language in our country and there's a LOT of interest in it. "Baby sign" programs have also shown its value with more than those who have a language or hearing problem. It encourages communication at an early age, helping infants and toddlers express their feelings and what they want. This can reduce frustration and misunderstanding for both adult and child. I often have taught such programs, including programs for interested young audiences to introduce them to it. Because of this I often tell a story in voice and sign, teaching first the signs basic to the story. Often these signs are simple concepts like colors, animal names, that type of thing. When I was doing weekly preschool programs as a librarian, I used signs as an added way to learn basic concepts. It also is a great way to involve more than one learning style. Research shows the more learning styles used, the better something is learned. Sign language has several variations even within the United States. By telling in voice and sign it tends to move my signing from the American Sign Language end of the spectrum more towards Pidgen Sign, which is signing in English word order. It also tends to streamline my spoken words to coincide with what I'm signing. While I don't usually do an entire program in sign, I have enough stories to put one together. I also have done entire programs in voice and sign when the audience included deaf classes with hearing classes. To do that, you need to get to a fairly conversational level with a lot of vocabulary. This book originated in paperback, which is now out of print, but Amazon offers a Kindle edition. 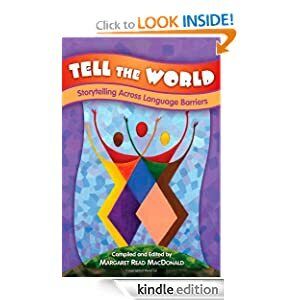 There's a lot more I could say, but you might find it worth reading a chapter in Margaret Read MacDonald's book, Tell the World; Storytelling Across Language Barriers. I wrote the first half of the chapter on Translation into a Signed Language; then a licensed interpreter wrote the second half. Whatever you decide, I'd strongly recommend a class in A.S.L., preferably from somebody with strong ties in the deaf community to help you understand more. One last thought, I've found signing also helps when telling with people whose native language is not English, but they're trying to learn it. Many signs are called "natural signs" as they use a sign that matches "natural" gestures. As mentioned in my list of reasons above, the more senses you can bring into learning is always worthwhile. Signing uses both your visual and kinesthetic abilities. 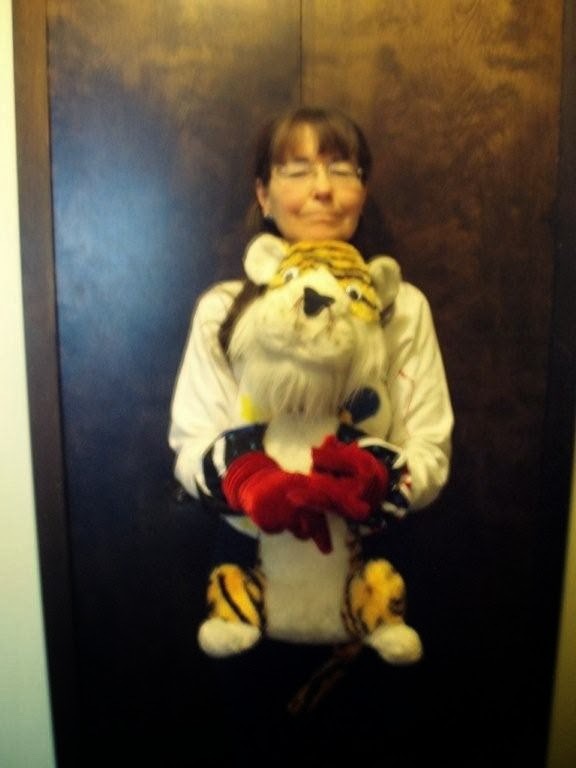 I even have a large puppet that lets me sign. The following comments came after I wrote the above article, which I've expanded and edited here for this blog. The heart of my comments were part of a forum discussion on Professional Storyteller, an international network of storytellers. Lois: I could not have advised any better than you have. I have a background in ASL and use it when telling stories from my young readers book: "MIDNIGHT AND THE MAGICAL PRAIRIE SCHOONER." The only other ting I would add, Daniel, is the importance of respect for ASL as it is also the culture of the Deaf. I find using "pidgin" used with sim-com (speaking simultaneously) useful with an all hearing audience. I also feel a strong sense of responsibility in educating children in ASL. So, when Lois says take a class in ASL, she's spot on. But also know that the best way to both show your respect for ASL and the Daf community and the best way to learn ASL is to socialize with the Deaf. They are not only the best teachers, you will also find them to patient and eager to teach. Best of Luck, Daniel and Lois in bringing us closer together through sign story. Oh, one last thing. Daniel, check out a series of tapes called - I think this right- "STORIES FROM THE ATTIC" with Billy.. forget his last name. Very basic kids stories. This is precisely why I say "The deaf community is a true community and American Sign Language is a true language." Hopefully anyone taking a class in ASL also gets an introduction to this. Getting out and associating with deaf individuals and groups helps you discover just how much you don't know, while feeling the support that comes from having a relationship. CODAs (Children Of Deaf Adults) and interpreters can also help you, but the goal is communication, so the more that comes directly to you from anyone who is deaf, the better. at ETSU we have two amazing interpreters, Libby Tipton and Tracy who I am afraid I don't know the second name of, who do a lot of storytelling interpretation both for us and at the National Festival and other NSN and ISC events. Libby is also a speaking storyteller. Recently ETSU organisation Silent BUCS hosted Peter Cook - internationally reknown deaf storyteller - and he teaches narrative development for interpreters - and anyone else who wants to tell in sign. http://professionalstoryteller.ning.com/events/narrative-development-in-asl I can't find a direct link to Peter's own website via google at present - just lots of his gigs - but I'll ask then post it. Daniel's initial post made me a bit wary as I read it (probably not how it was intended) as seeing ASL as an easy way to extend a repertoire and get more bookings - something I think we speaking storytellers need to be very careful of. More recently those classes for parents and other caregivers have been something I offer in addition to my storytelling. Warren Public Library offered it last winter and spring and will again offer it starting Tuesday, September 30, 2014 at 6:30 p.m.with follow-up sessions on the last Tuesday of each month. To register or find out more go to: Warren Public Library or call the Civic Center Library at 586-574-4564. Yes, sessions tend to end with me telling a story in voice and sign language.